More passengers have travelled through London Luton Airport (LLA) on one day than ever before - with over 50,000 arriving or departing. May 27 is when LLA set a new daily best, surpassing any other figure stretching back to its 1938 launch. A total of 50,564 customers, including many holidaymakers flying abroad for a half-term break, used the Bedfordshire-based travel hub. 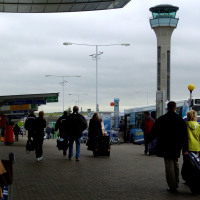 The airport also reported a 17.6% rise in users over May compared with the same month in 2015, which represents 26 months of expansion in a row. Whichever airport passengers fly to or from, the holiday industry recommends that they take out travel insurance. This will leave them feeling safe not sorry since it covers a multitude of mishaps, including lost luggage and stolen possessions such as sunglasses. It also protects holidaymakers against cancelled flights and mislaid travel documents. Gatwick and Heathrow are not the only airports with expansion in mind. Both are currently vying to win Government approval for a new runway. Meanwhile, LLA is looking to fill the gap during the decision-making delay by increasing its capacity by half under a project worth £110 million. This means it will be able to handle 18 million travellers per annum by 2020. Nick Barton, chief executive of LLA, says that it plays a crucial role while ministers get round to making a decision on the South East's new runway. He says Luton's latest May figures show that demand is growing. Wiz Air, Ryanair and easyJet are among the liners serving Luton. LLA flies passengers to and from 123 hotspots, including Barcelona, Lanzarote, Las Palmas, Reykjavik, Rome and Vienna.